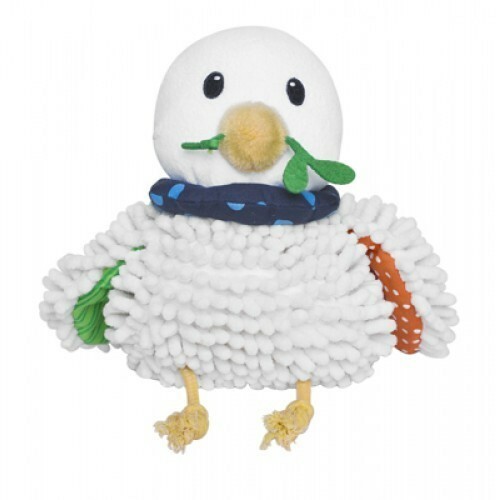 Lil' Prayer Buddy Dottie the Dove is a plush, prayerful, and playful toy for children. With a press of the wing, a child's voice recites the Peaceful Heart Prayer & Matthew 5:9. A second press turns it off for quiet time. An engaging toy for toddlers. Makes a wonderful baby gift. The Lil' Prayer Buddy Dove is an excellent interactive toy for teaching little ones to pray from a very early age. Peaceful Heart Prayer: Your peace is in my heart, O Lord. Your peace is on my mind. Please help me spread this peace around by being loving, true and kind. I try my best in all I do, in who I'm called to be, and remember that I'm to treat others the way I want them to treat me. Matthew 5:9: Blessed are the peacemakers, for they shall be called sons of God.